President Hugo Chavez think that the United States tried to turn Venezuela's military against him to undermine a constitutional reform that could let him govern for decades. Chavez, a former army lieutenant colonel who survived a short-lived 2002 coup, said his domestic opponents are collaborating with the U.S. Central Intelligence Agency to spur another putsch. "The conspiracy has already begun. The messages are circulating in the barracks. 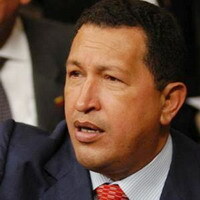 The hand of the CIA, the empire, is behind this," Chavez said on his weekly radio and television program. "They are trying for a coup." The Venezuelan leader did not elaborate or give evidence of the purported plot. He has made similar accusations before, which both opposition leaders and U.S. officials denied. Last week, Chavez proposed a constitutional reform that would abolish limits on re-election and extend presidential terms from six to seven years. But he denies opponents' allegations that he wants to become a lifelong leader like his close ally Fidel Castro of Cuba. U.S. officials have not commented on the proposal, but Washington has repeatedly accused the former paratroop commander of consolidating power and weakening Venezuela's democracy. Critics say Chavez's proposal would diminish possible challenges to his authority by curbing the powers of state governors and mayors in favor of local organizations called "communal councils," which depend on the government for funding. In typical style, Chavez spoke for hours Sunday, sending greetings to Castro and joking with Argentine soccer legend Diego Maradona. "Fidel, how are you?" Chavez called out in English, prompting loud applause. Chavez said he spoke to the Cuban leader on his 81st birthday last week and sent him a painting of 19th century independence hero Simon Bolivar. He denied recent rumors that Castro is near death, and said, "We will all die one day, but Fidel is one of those who will never die. He'll always be present in our America." Chavez has regularly offered updates on the health of Castro, who has not been seen in public since emergency intestinal surgery over a year ago forced him to cede power to a provisional government headed by his younger brother. Chavez also greeted Maradona warmly, calling him Argentina's "Golden Boy" and urging him to reveal the details of his notorious "Hand of God" goal against England in the 1986 World Cup quarterfinals. Maradona said he was unable to reach the ball for a header because England goalkeeper Peter Shilton "was very tall." Chuckling, Maradona said he urged his teammates to celebrate with him following the goal so the referee would not realize what had really happened. "The goalkeeper had the advantage of grabbing with his hands," Maradona said. "It was too high for me and I stuck out my fist."